Years after making waves at Babe’s of Carytown, ANIMAL is lighting up the River City once more at The Hof. Pulsing bass and treble under your feet, around your head. It feels like it’s coming from deep inside your body. Spurts of fog blast out from under the stage, and wisps linger around technicolor lights. It’s all aglow — and people are dancing. You’re dancing. Suddenly pulled into a unified body, you’re swaying, arms flying, and smiles flash through the crowd in strobes. 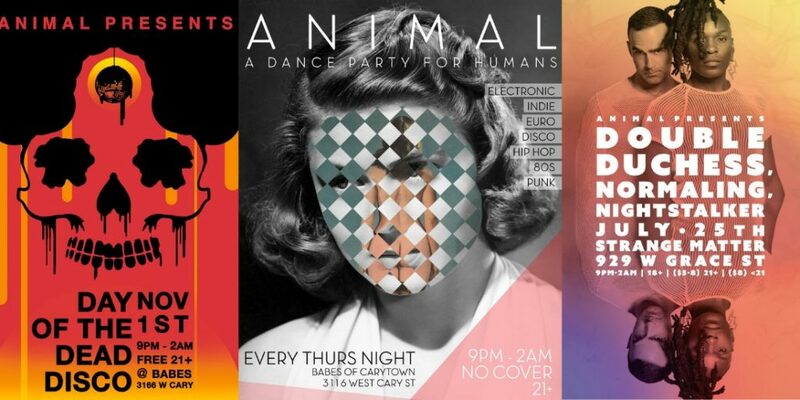 This is the essence of an ANIMAL dance party, an all-inclusive staple in the Richmond queer community and beyond. Some Richmonders remember ANIMAL’s humble beginnings, a weeknight event at Babe’s of Carytown in the long-gone days of 2012. But seven years later, the collective has evolved into an ever-anticipated weekend bash: theme nights, interactive props, and collaborations with legendary artists such as Mykki Blanco and Big Freedia. “The best thing about ANIMAL has always been our community, and the energy we create together,” founder and DJ Conley Thurston Billings said. Billings has seen major life changes in recent years, and has been slowing down ANIMAL events (he, for one thing, is a new father). While enthusiasm and participation stayed high, 2018 saw ANIMAL parties slip to a trickle. The annual Halloween party couldn’t be passed up, held at the self-described “goth, industrial, fetish club” Fallout and boasting a competitive costume contest. There was also a wild, emotional send-off for Strange Matter, held in the beloved venue’s final days — where were you when Strange Matter cut the soundboard and locked its doors for the last time? It was somebody, somewhere, who once said that all good things must come to an end. No matter how wild and crazy. No matter how inclusive and diverse. Endless nights of dancing where anyone and everyone can be exactly who they are, and that’s okay. No, it’s more than okay. It’s preferable, actually. It’s perfect. Time marches on. Years pass. Things change and eventually end. According to Billings, this is a given of life. And someday too, ANIMAL will meet this same fate. After an extended hiatus, ANIMAL will be back this Saturday with Dancing in the Darkroom at the Hofheimer on West Broad. The stylish, intimate space will feature the usual ANIMAL amenities and performances from local musician Baby Momo and Billings himself under his DJ name Dirt Thurston. “Mark yr calendar!!! Expect booty-shaking beats and dancing with friends!” the event page reads. It seems that the time off for ANIMAL has only lit the flame brighter. As the weekend quickly approaches, over 300 people have marked themselves “interested” in the event on Facebook — nearly three times the capacity of their chosen slice of the Hofheimer venue. According to Billings, the idea for the event came almost on a whim. It had been months since ANIMAL’s last event, and on a drive to Portsmouth with his wife, the couple passed the time by discussing ANIMAL, and eventually, planning the party. “Before you know it, I’m booking the reboot in the Dark Room at the HOF before we’ve even gotten off of Interstate 64,” Billings said. This is all, obviously, very exciting for many people. But before we punch our time sheets Friday evening, before our hallowed Saturday afternoon, thumbing through magazines and chatting with friends on front porches.. Before we gear up, and pile into a brigade of Ubers and Lyfts destined for the Hofheimer, let’s circle back and examine the man who made it all happen. Like a familiar backdrop, music has always been a part of Billings’ life. Middle school brought Billings his first musical identity. Memory fades and blends as time passes, and for Billings, it’s a haze of rubber wheels, slick rhymes, and the throb of a stereo system. The archetypal younger sibling, Billings found himself rummaging through his older sister’s room one day when he unearthed Ramones and Violet Femmes cassettes. He instantly fell in love, he said, adding punk rock to his list of sonic obsessions and garnering a new respect for his sister. “I was into hip hop and punk, so it was kind of a weird mix at the time,” Billings said. By the mid-90s, some dance music tracks started creeping into his tape deck, and he remembers attending a RISE rave in Baltimore, where he lived at the time. “Dancing to techno music took it to a different level, and sometimes was more like storytelling,” he said. Fast forward a decade, and Billings is becoming a house show veteran, building his music collection with artists such as Glass Candy, the Need, Erase Errata, Le Tigre and Tracy and the Plastics. In 2005, he witnessed the birth of Are We Not Men, a queer dance party at The Depot in Baltimore, and soon, he was guest DJing there. He later became a full-time resident act. In 2007, Billings’ sister passed away after a long battle with kidney disease. He took a pause and stepped back from city life for a number of years, buying a house in Manassas. “It’s hard to get up and go dancing if you’re sad,” he said. Though he bought his own DJ equipment — and, after a while, began hosting house parties — it wasn’t until he moved to Richmond in 2011 that Billings delved back into the large-scale dance scene. A new face in the River City, Billings debuted ANIMAL one humid July night at Babe’s. It was slow at first, and some changes were in store before the party would grow into the collective it is today. Almost immediately, Billings met Joseph Whitfield, a recent VCU Sculpture graduate at the time. They had actually met months prior, when Whitfield and his partner bought a couch from Billings on Craigslist. “That was our first interaction and we didn’t know that a few months later we’d actually run into each other and end up working together on ANIMAL.” Whitfield said. Billings invited Whitfield to a show, handed him a flyer, and when the day came, he was there. Remembering that night, he said he was excited by the diverse, progressive music (stuff that was perfect for dancing), but that the Thursday night was a “hard pull” for a new face like ANIMAL. “I was like: oh, this is really cool, but no one’s here,” Whitfield said. He became ANIMAL’s “cheerleader,” taking point on marketing, branding and kindling their social media presence, learning as he went, “ad-hoc,” “DIY.” It was the birth of a dynamic duo: Billings on the ground, in the thick of things DJing and working with artists, and Whitfield behind the scenes. It’s nearing 2013, and things are starting to pick up. “From there, we started developing our queer collective by planning bigger monthly events through benefits, themed events, guest DJs, MC’s, bands and collaborators,” Billings said. Billings was hit with another tragedy in 2013, when his mother died from ALS, also known as Lou Gehrig’s Disease. “There really are no words to comfort the devastation and heartbreak of losing a loved one,” Billings said. He took the summer off to process, and returned when we was ready later that year for a PRIDE celebration. Before its ultimate growth spurt (peaking between 2014 and 2016, according to Billings), ANIMAL metamorphosed, spreading out to venues across the city rather than being rooted in a singular place. This change was practical as well as symbolic. ANIMAL became more of its own event, and was able to experiment more with music outside of the typical bar or club range. After creating ANIMAL, Billings, who is transgender, made the decision to transition. Although he said involvement with the collective was not the reason he decided to make the step, he is thankful for the support of his friends and ANIMAL. “Ultimately you need to make sure you’re keeping yourself happy,” Billings said. Billings said he dubbed the collective ‘ANIMAL’ because of the way he sees animals: “androgynous” and not held back by gender constructs. ANIMAL, and the people who made it happen, have seen their fair share of ups and downs and major life changes. They’ve slowed down, but with an explosion of queer-friendly events and dance parties spanning the city (PurpleLife, BodyTalk, Ice Cream Social, Formula, Movement, Behavior, Weird, Party Liberation Front), and with Dancing in the Darkroom just days away, it’s safe to say their spirit — and their movement — is still going strong. Whitfield will be moving out of Richmond soon, and another major collaborator, David Riley, is working through his degree at VCU. It’s hard to say what the future holds for ANIMAL. Billings is careful to make no promises. This is what makes a city like Richmond special. When ANIMAL eventually ends, there is a new generation already honing their creativity and skill, ready to pick up the slack. Until then, they’ll work together to keep the city alive with excitement, inclusivity and art. “I think it’s just part of evolution, I think that’s just the way it goes. It’s the way the music industry always goes… what’s happening today might not be happening later,” Billings said. Photos courtesy of Joseph Whitfield (ANIMAL) and Wes McQuillen (Colorful).